Since the new projects I’m working on aren’t quite ready to be revealed, I thought it might be fun to do a book review this week. Background: I decided to do my first embroidery project in September 2012. I found a pattern I liked and completed it as the first square of my sampler quilt. I did stem stitch for the entire thing since instructions came with the pattern, and I used all 6 strands of my embroidery floss. Since then, I’ve been poking around on Pinterest and finding many new projects that would require enhanced skills. (Check out my Embroidery board on Pinterest!) I’ve read about different techniques and how most embroidery experts use fewer strands of floss. 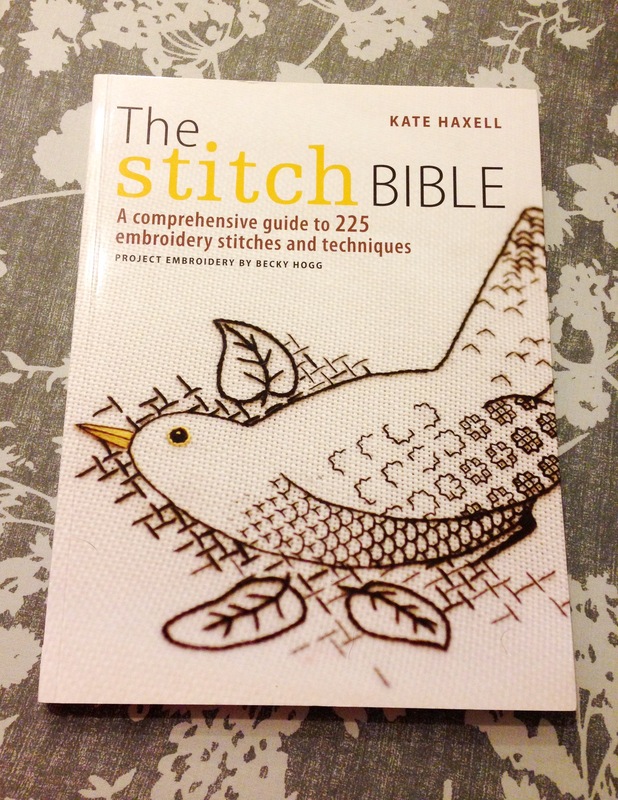 When I found The Stitch Bible by Kate Haxell, I was really excited. I admired it online for months before deciding to buy myself a copy. A major reason for the hesitation was that, due to copyrights, the only photos I could find were of the cover; I wasn’t sure what to expect inside. I didn’t see it at my local stores, although I have to admit I didn’t look especially hard. Pros: There were some things this book did really well. First, it had really detailed stitching tips. The stitches themselves appeared in the usual A-B-C format graphically, but there was plenty of supporting commentary. Not only did the book cover each stitch extensively, but it also included a wide range of stitches. Finally, the book did a good job of laying out the more basic aspects of embroidery, such as selecting the correct fabric, which needles to use, how the different threads/yarns compare, history of each type of embroidery, etc. Some of the tips were things I’d already read, but many were new. Neutral: I thought this book would cover many filling stitches for traditional embroidery. Instead, the book split its time among freestyle, hardanger, blackwork, crewelwork, goldwork, pulled thread, canvaswork, and drawn thread–in addition to the basic overviews I’ve already described. I personally would have preferred less of the canvaswork, for example, and more of the blackwork section (featured on the cover). But I do understand this is a matter of personal preference. Conclusion: This is the only sewing, craft, or embroidery-related book I have purchased, and I don’t regret my purchase. I find that, combined with the internet, it will be very useful. The book names the stitches and diagrams how to create them. I can supplement with the internet to see what the finished products might look like and how the stitches have been used in other projects. Categories: Embroidery | Tags: book, crewel work, embroidery, floss, instructions, kate haxell, purl, review, stitch bible, styles | Permalink.